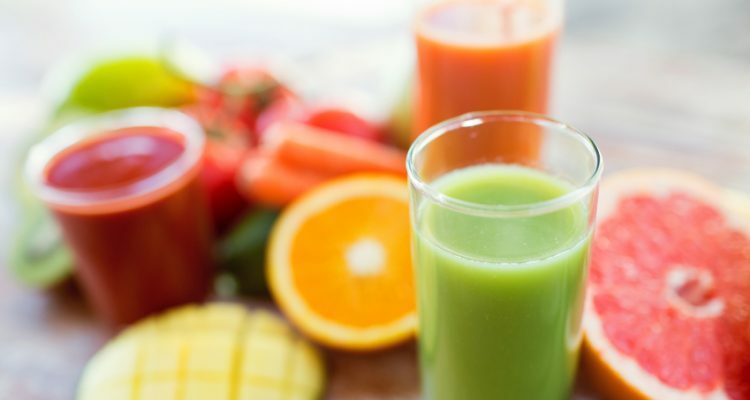 Heart disease and cancer prevention: Jeanette Jenkins suggests that a delicious organic strawberry-orange-kiwi smoothie can help! Hollywood trainer Jeanette Jenkins shared a snapshot of two pitchers of deliciously-looking pink smoothies, surrounded by a conglomerate of fresh strawberries, oranges and kiwis, on her Instagram account on Tuesday. The photo (below) is appealing on its own, but the nutritional aspect to the smoothie is what makes it even more interesting. The trainer stated that the organic strawberry-orange-kiwi smoothie not only tastes good, it’s healthy and relatively low in fat. With 139 calories, it has 7.5 grams of fiber and is chalk full of vitamin C and anthocyanins, which can help burn stored fat and reduce one’s risk of cancer and heart disease. A recent study out of the Harvard School of Public Health and Harvard Medical School associates eating blueberries and strawberries with improved heart health. For the study, researchers looked at data from the Nurses’ Health Study; there were 93,600 female subjects between the ages of 25 and 42. Subjects reported on the type of foods that they ate and how often they ate them over a period of 18 years. Researchers discovered that there was little difference between women who munched on a few berries every once in a while and women who didn’t eat berries at all. The women who experienced heart benefits ate three or more servings—one serving was considered to be half a cup—of strawberries and blueberries on a weekly basis. Female subjects who ate the smallest amount of berries had a higher risk of suffering from heart attacks. Women who ate the most strawberries and blueberries had a 34 percent reduced chance of suffering from a heart attack compared to women who ate the least berries. In another randomized trial (study results were published in Cancer Prevention Research), researchers studied the effects of freeze-dried strawberry powder (mixed with water) in patients with esophageal lesions in high-risk areas for esophageal cancer. Results indicated the potential of freeze-dried strawberry powder for preventing human esophageal cancer! After six months, researchers discovered that higher doses (60 grams per dose) lowered the histologic grade (the tumor grade used to evaluate cancer patients), of atypical premalignant lesions in about 80 percent of the 36 patients at this dose who were evaluated for histological types of cancer. In addition to berries, other foods that can help prevent heart disease include whole grains, sweet potatoes and legumes. Of course, don’t forget to munch on a few handfuls of berries throughout the day. Studies show that the anthocyanins found in berries is beneficial for cardiovascular health and can help lower cholesterol. If you have a sweet tooth, check out this delicious recipe for healthy blueberry muffins! Jeanette Jenkins, Instagram, March 22, 2016. “Eat blueberries and strawberries three times per week,” health.harvard.edu; http://www.health.harvard.edu/heart-health/eat-blueberries-and-strawberries-three-times-per-week, last accessed March 23, 2016. Chen, T., et al., “Randomized phase II trial of lyophilized strawberries in patients with dysplastic precancerous lesions of the esophagus,” Cancer Prevention Research, 2012 Jan; 5(1):41-50. doi: 10.1158/1940-6207.CAPR-11-0469. Epub 2011 Dec 1.